Since 1934, an iron thread had linked Grenoble to the top of Bastilla. The famous « bubbles », with their transparent walls, will give you an unforgettable memory...which had been already shared by 14 millions of visitors ! A journey through the airs, with the city under you feet, down below. Round-trip ticket for a child: from 4.60 €. In 1934, a long time before the « congés payés » had been settled, a cable-car dedicated to tourism was built in the slopes of the mountain, which took its roots at the beginning of the left edge of the river Isère. It was bound to be one of the first urban cable-cars of the world, after Rio de Janeiro and Cape Town. 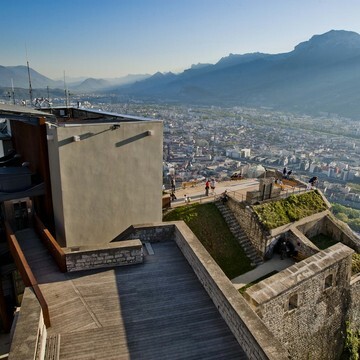 Since this time, Bastilla has been a priviledged spot for Grenoble inhabitants and tourists. More than 14 millions of people have been carried since its creation. The « bubbles », genuine symbol of the town, were built in 1976. 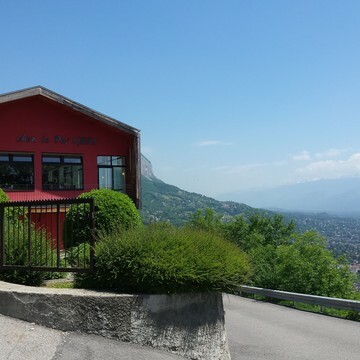 With 260 000 people on average coming there every year, and almost 4000 hours of opening (the French average for such equipments is closer to 2000 hours every year ), the cable-car of Grenoble Bastilla can be proud of its exceptionnal performances. The Cable-Car can carry up to 6 people par cabin. Night and Day, all over the year, come and travel through the air !